I don't think I even knew about this. The Rock seems to be the leading man in 2-3 action movies a year. He's for sure gonna make that jump. I don't need to watch this trailer either, I'm already going to see it. I am Rawson Thurber, the writer-director of SKYSCRAPER and I’m here to answer all your questions! AMA! How much did inspiration did you take from Die Hard to make this? Die Hard is one of my all time favorite films. It’s on the Mt. Rushmore of action pictures. 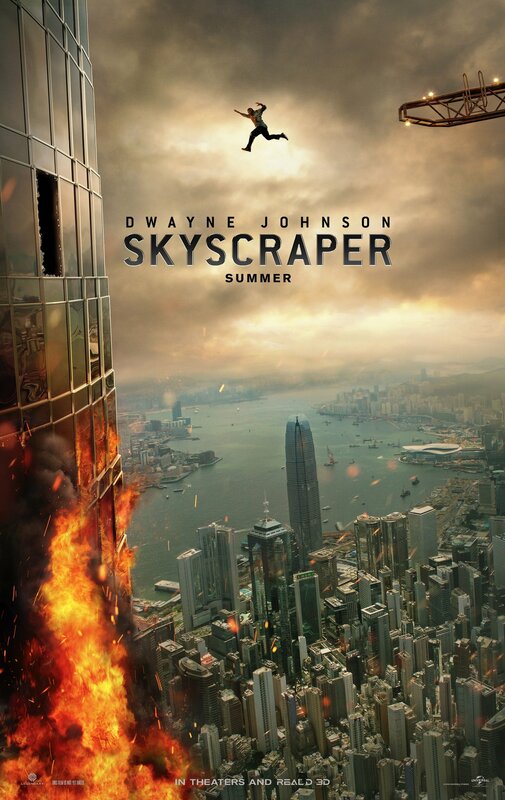 Skyscraper is a love letter to Die Hard and films like it. I grew up on late 80s and early 90s action. So, Skyscraper owes a debt not only to Die Hard, but the Fugitive Cliffhanger and Towering Inferno. I hope the film feels like a throwback in a great way. Pretty good answers in there, especially the Kevin Hart one. I planned on seeing this some Friday morning after work, but at the time I forgot that JocelynJane would be off work for summer break. Unless I see with a friend some evening, I won't be seeing in theaters. I'm guessing based on some quick math, you could throw her at least 3 feet. Guess I didn't give my full pinion of this movie. If you are home alone some Friday night and feel like playing around on your phone while drinking some light beers alone, this movie is for you. The movie telegraphs important plot points so obviously, like rebooting the phone and the completely pointless computer hall of mirrors. Of course those are going to be the 2 things that save the day. The movie was dumb, but it had some great impossible action. The Rock can literally do anything he wants. He is a superhero. Surprisingly this movie didn't have a lot of intentional humor. It was hilarious when The Rock would do something and survive, but that wasn't suppose to be funny. There were maybe only like 3 jokes in the whole thing. Could have used a wacky character somewhere to bring some laughs. Best part of the movie. 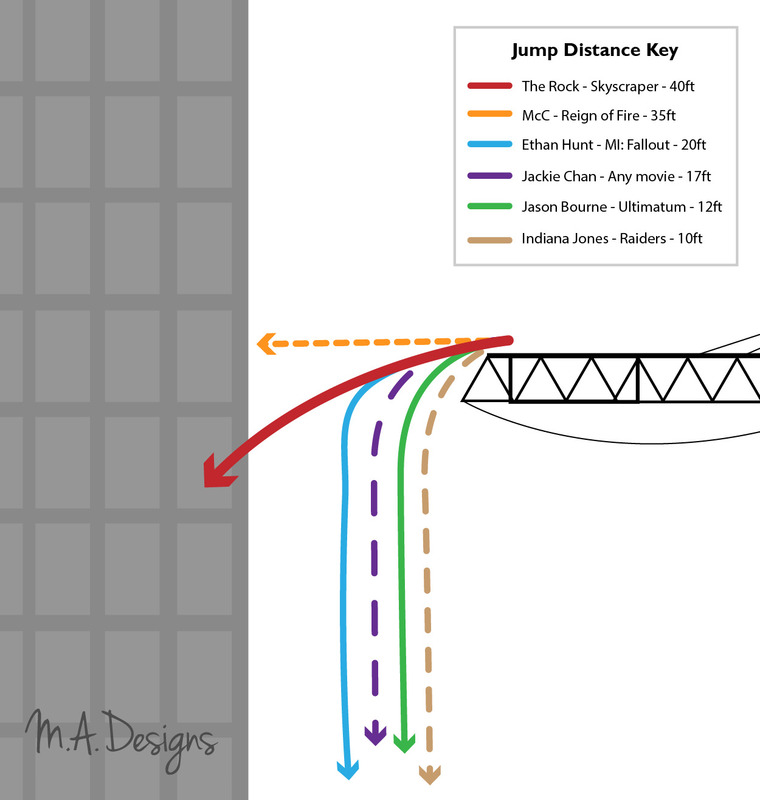 The Rock climbs on the outside of a crane...OVER 100 STORIES with no ladder or stairs. Just up the side of it. He does it in literally minutes and isn't even tired. Tyler wrote: Source of the post it had some great impossible action. It's the Rock, nothing is impossible. I need to watch this. Maybe tonight or tomorrow while Erin is working and I'm on baby duty. Watched this last night while watching the kid. You're right, there was almost no comedic relief throughout the whole movie which is kinda strange for a The Rock movie. Only joke I can think of is when he says "If you can't fix it with duct tape, you didn't use enough duct tape" as he's taping up his injured shoulder. It's a fine mindless action movie. Super predictable. When he tells his wife to turn the phone off and back on again to fix it within the first couple minutes of the movie, I knew that would eventually be how they fix something in the end. Some of the acting was kinda bad. Obviously not from Dwayne Johnson, but I thought anytime the main bad gal had lines she was awful. Also the main Hong Kong cop guy had some really bad lines. Favorite part was The Rock's one-legged hopping tackle while he was fighting his old buddy early in the movie. And yes, he could really do anything he wanted in the movie. No physical limitations. Funny that his friend went for the leg right away. Quick, its his only weakness!